Each year at this time, the best-and-brightest at every major Wall Street investment firm present their highly-educated and generously-compensated prognostications for the coming year. There are 22 such luminaries bearing the title “Chief Market Strategist” at well-known firms like Goldman Sachs and Morgan Stanley. 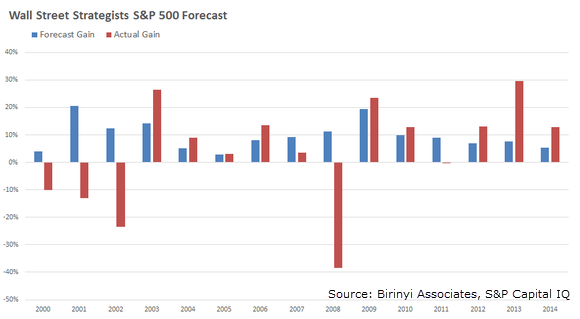 Each year they are asked to forecast what the stock market will do over the next year. They have access to the best information, Ivy League-educated economists, teams of analysts, and connected politicians. We can’t expect their track records to be perfect, but surely these folks produce truly superior predictions…right?